Therefore, there is now no condemnation for those who are in Christ Jesus (Romans 8:1 NIV). This email comes to me hundreds of times every year. The names are different, the situations are varied, but the underlying theme is the same…I can’t forgive myself. Grace just doesn’t make sense. I don’t deserve to be forgiven. And these women are right…grace doesn’t make earthly sense. We don’t deserve it. We keep reliving the Garden story with ingratitude and believing Satan’s lie, and then grace shows up with an outstretched hand. “I don’t deserve it,” we cry. And we’re right. Grace, by its very definition, is unmerited favor from God or a gift we don’t deserve. But until we accept God’s grace and forgiveness, Satan will hold us in the vise grip of guilt, and we will miss moments of sudden glory as we hide in Eden’s bushes of shame. After King David’s affair with Bathsheba, he was held in the shackles of guilt, unsure if he could ever be set free. But mercy came with the key of forgiveness and flung the prison door open wide. David then had to take the necessary steps to walk out of the prison and into the kingdom of grace. No matter what you have done, God has made a way for you to be set free—a very costly toll has been paid for the road to your restoration. Jesus gave His life that you might have not only eternal life after physical death, but life filled with moments of sudden glory beginning at your spiritual birth. I in no way want to diminish the seriousness of sin. Neither do I want to lessen the truth of grace. Refusal of the Christian to repent and dogged determination to continue a lifestyle of sin spits in the face of what Christ did on the cross. Unconfessed sin draws the shade on God’s glory. Confession with repentance raises the curtain once again for God’s glory to shine through. When we say, “I don’t feel forgiven,” that is like saying that what Jesus did on the cross is not enough. Why should we require more from ourselves than our Creator requires of us? “Therefore, there is now no condemnation for those who are in Christ Jesus….” (Romans 8:1). None. God’s grace river washes away the devil dams of shame and condemnation that block the flow of the glory life. If you are feeling condemnation for past sins that you have already asked God to forgive, that condemnation is not coming from God. Once you have repented and asked God to forgive you, it is finished, over and done with, wiped away. If feelings of condemnation persist, they are a result of listening to the accusations of the enemy as he tries to keep you behind those bushes and away from union and communion with God. Believe the truth. Walk in the truth, and it will lead you to moments of sudden glory all around. Without accepting God’s grace gift, in Him we live and move and have our being will be nigh to impossible to become a reality in your life. A life saturated in grace makes it so. Satan knows that the slightest whisper of guilt is easily received by a fragile heart plundered by life. Do not let him convince you to remain in hiding. If you have been crouching in Eden’s bushes of shame, listen closely. That sound you hear is God walking your way. Whispering your name. Do you hear it? Singing love songs of grace. Inviting you to stroll with Him in the garden of your heart where He has taken up permanent residence. Where are you? I want to commune with you. I want to show you glimpses of my glory. Where are you? Heavenly Father, I am so thankful for Your grace in my life. Today, I refuse to listen to the lies of the devil that condemn me, and commit to listen to the promises of God that free me. Open my eyes to see You as I look through the lens of gratitude and grace. I love You. I’ve never done this before, but I really want you to get it. I want to get it. Let’s read this excerpt from today’s devotion one more time. Savor it. If you are feeling condemnation for past sins that you have already asked God to forgive, that condemnation is not coming from God. Once you have repented and asked God to forgive you, it is finished, over and done with, wiped away. If feelings of condemnation persist, they are a result of listening to the accusations of the enemy as he tries to keep you behind those bushes and away from union and communion with God. Believe the truth. Walk in the truth, and it will lead you to moments of sudden glory all around. Do you long to feel close to God but feel like there’s something missing? That you’ve missed that mysterious formula to make it happen? Do you have a glory ache—a persistent longing to experience God’s presence and working in your life, but you’re not quite sure how to make it happen? 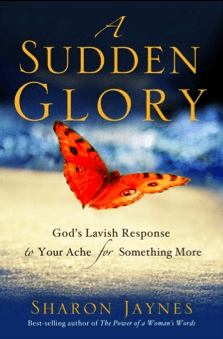 If so, my book, A Sudden Glory: God’s Lavish Response to Your Ache for Something More, is just for you. Join me in discovering how to erase the lines between the secular and the sacred and experience a deeper, more intimate, relationship with God than ever before. While you’re there, you can download a free chapter or watch a video book trailer.